A local referee David Thornhill (Norwich City fan and qualified referee, who also featured in Saturday’s match day programme) stepped in as fourth official when assistant referee Mark Jones was forced off through injury during the 1-1 draw between Norwich and Preston in the Sky Bet Championship on Saturday. 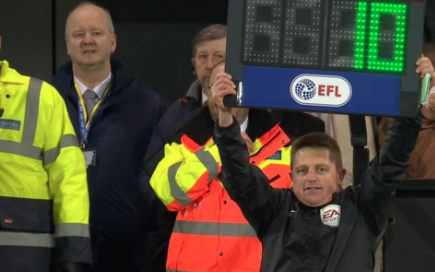 This meant that the fourth official, Andy Davies, had to take his place, leaving the fourth official position uncovered. And, I have been able to found another such incident where an elderly football fan replaces linesman, after Female referee gets injured In FC United Of Manchester Evo-Stik Northern Premier League game at Nantwich Town . Are there any more incidents where someone watching the game (qualified) has to replace fourth official or referee? Note: Anyone can not replace referees or 4th official, that replacing person has to be qualified to do so. And this type of incidence is most likely to happen in lower leagues. I know of a match I attended myself, which preceded the 4th official. Referee Georg Dardenne had an injury in the 52nd minute of the game and was replaced by his assistant Josef Funken. The vacant position then was filled by Helmut Hübner from the audience, who had the referee license for the 3rd division making him eligible to assist in the Bundesliga. It also happened a few months ago for the Belgian cup, not in the earliest stages, but in a game between top level clubs. KV Mechelen - RC Genk. After two injuries there was no linesman left, so the stadium announcer asked if there was a referee present at the game. And also added it was not a joke. A KV Mechelen fan stepped up to do so. Fun fact: the man said afterwards it was fortunate it did not happen in a weekend game, because he would have had some beers then. In 1972 (when the officials required for an association football match were a referee plus 2 linesmen) during an Arsenal vs Liverpool 1st Division game, linesman Dennis Drewitt pulled a muscle and was unable to continue. Television pundit, former player and qualified official Jimmy Hill was watching the game and responded to a tannoy request for help. He changed into a tracksuit and ran the line for the remaining portion of the game. Not the answer you're looking for? Browse other questions tagged football trivia officiating or ask your own question. What footwear (if any) is required when playing in official football games? Has a team ever refused to participate in the World Cup finals after qualification?